L'Occitane Shea Whipped Collection / Gee Whiskers! I often look at the products I love and think "how can the company possibly make this product better?". L’Occitane answered my question with their newly launched limited Shea Whipped Collection. It is the Shea Butter products we have grown to love but transformed into a beautifully light experience. I have tried out a few of the Shea Butter products and love them for their rich moisturisation and how my skin immediately looks and feels so much better. The Shea Whipped Body Cream (R350 for 100ml) and Shea Whipped Hand Cream (R120 for 30ml) have made the products such a pleasure to use because it feels like you are applying mousse to your skin – soft, light and airy – yet you still get all the benefits of the beloved Shea Butter range. My personal favourite is the Shea Whipped Shower Foam (R250 for 150ml). 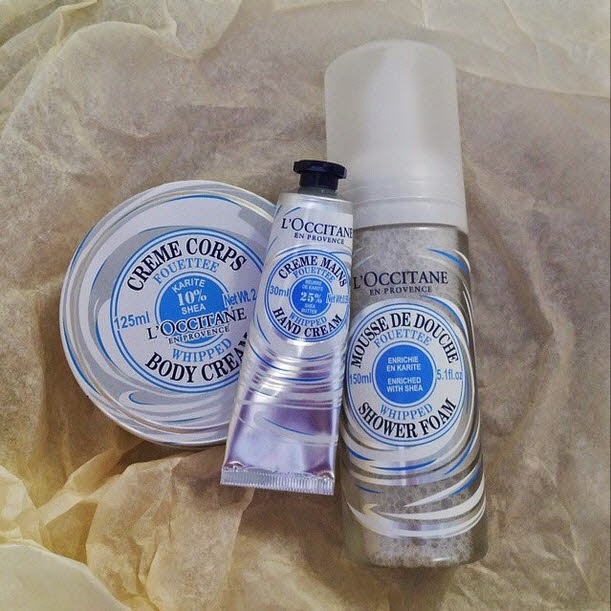 L’Occitane is a winner with their shower gels and bath products in generals. I battle with dry skin so I look for shower gels and soaps that will hydrate my skin. I really love the novel idea of the product being dispensed out of the bottle as a foam, it changes things up and makes it a treat to use. As with all L’Occitane products, a little goes a long way - Cleans your skin well and leaves you with a silky film of shea butter on your skin. I will definitely purchase this bottle once I have used this one up. The Whipped Shea Butter Collection is available in stores and on-line as of today – go ahead and spoil yourself! PS. To learn more about the Shea Range visit the L'Occitane website. I love this collection! It's so much better when the percentage of shea is higher. Great Post!